Despite, doing lot of efforts, consulting number of astrologers, applying uncountable remedies, if the marriage of some one is getting late, it means you need deep anyalysis of birth chart. We provide deep analysis and find out the real reason of delay or hurdle in the way of your MARRIAGE AND LOVE MARRIAGE. 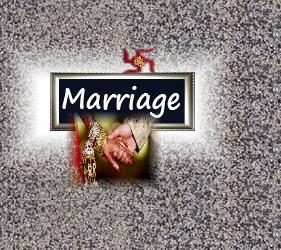 The solutions, we provide are very rapid and result oriented which fulfill your desire of MARRIAGE OR LOVE MARRIAGE. In this section alongwith your birth chart, we study your HAST REKHA as well as face also, so as to find the accurate reason of delay in the way of marriage and accurate remedies for the completion of your desire, thereupon.